On 9th November the stranded cement carrier Fjordvik (3,091gt/ 1976) was moved from her dangerous resting place on the rocky breakwater at Helguvik (see January 2019 edition) to within the confines of Keflavik Harbour a week after she came to grief. The 15 crewmembers had been rescued at the time of the incident and 104 tonnes of fuel had been pumped off the vessel. How badly damaged the vessel had been, and what her future holds, remains to be confirmed. The 20,986gt/1984 built Bulk Carrier Golden Ocean suffered a suspected engine room fire whilst en-route to Bontang to load coal on 10th November having called at Surabay. The ship was 28nm southeast of Bontang, Kalimantan, Makassar Strait at the time of the incident. All 22 crewmembers were evacuated and the fire was extinguished by several firefighting tugs that were dispatched to the scene. The Tanto Intim Line Handysize Bulker was later towed to the Port of Loktuan where the cause of the fire was investigated. Since September 2017 two sections of dry dock had been adrift in the Atlantic Ocean after breaking free from a tow to the Canary Islands when conditions whipped up by Hurricane Irma were encountered. Back in May 2018 the two sections were reported as being south of Bermuda and in early November one section materialised off Farmer’s Cay in the Exuma Island chain. This was anchored and lit by residents whilst a salvage plan was drawn up. Where the other section is remains to be seen. In the early hours of 15th November, the 5,798gt/1997 built freighter Paksoy-1 collided with the 1,666gt/1993 built cargo ship Eems Cobalt around 25km northwest of Borkum, Germany. The bulbous bow of the Paksoy-1 struck the Eems Cobalt amidships on the starboard side, punching a hole in her hull above the waterline. The two vessels remained stuck together until tugs arrived to pull them apart. The collision resulted in extensive damage to the Paksoy-1’s bulbous bow. After the ships were seperated the Paksoy-1 went to the Westerems anchorage. The Eems Cobalt was accompanied by the tug Waterstroom, Eemshaven Lifeboat and the workboat Neuwerk to the port of Eemshaven. The AIS track appeared to show the Paksoy-1 crossing the bow of the Eems Cobalt before making a sharp U-turn to starboard and subsequently striking that same ship. The errant vessel had been en-route from The Netherlands to St. Petersburg, which raised further questions about why the course deviation took place. 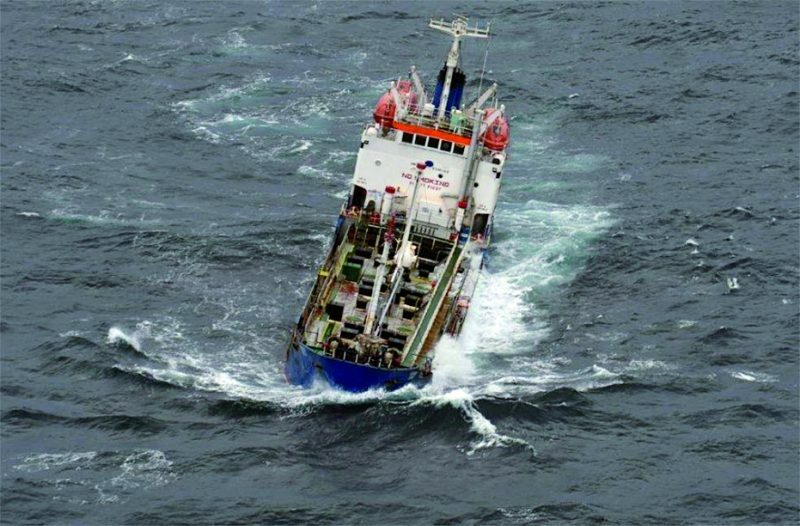 On 20th November the French Navy rescued 12 Indian seafarers from the Panama-flagged tanker Durban Queen (above) after the vessel ran into trouble and was sinking in the Persian Gulf. The French frigate Cassard reportedly picked up a distress call from the 1,025gt/1983 built Durban Queen when located around 13km into the Persian Gulf. A helicopter was launched and airlifted four of the ship’s crew to safety aboard a nearby commercial vessel. The helicopter made two additional trips to rescue the remaining eight crew members, including some with minor injuries, and bring them aboard the naval frigate for treatment. Those crew members were later transferred to a merchant ship and the frigate continued her voyage to Kuwait to participate in the bilateral naval exercise, Pearl of the West. A preliminary report by Norway’s Accident Investigation Board (AIBN) is raising questions about the watertight integrity of the Nansen-class frigates, with the spotlight being thrown upon Spanish shipbuilder Navantia, following the collision between Norwegian frigate HNoMS Helge Ingstad and the 62,557gt/2017 built oil tanker Sola TS near the Sture terminal in Øygarden, Norway on 8th November. The AIBN has reached an initial conclusion that confusion on the warship’s bridge during a watch change-over was the proximate cause of the accident, but the sinking of the ship was caused by progressive flooding that appeared to overwhelm the Helge Ingstad’s watertight integrity. Doubt is also now being cast on the design of other Naval ships built by the same company. Salvaging of the sunken ship got underway in December.